Performance: M326 has proven he is a sire of top end performance. He is a trait leader in 10 areas. Performance, carcass and all the breed indexes, and is in the top 1-2 % of the breed in most of these. M326 will sire deep, thick performance calves. M326 is the sire of some of our donor cows, and 2 of our next herd sires, Rib Eye and Radar. Radar was the high selling bull of all breeds at the 2006 National Western Stock Show, and Rib Eye was one of the top selling bulls in the 2007 National sale. M326 is heterozygous and will sire some horned calves. M326 is a decent calving ease bull, but not a guaranteed calving ease bull, as every once in a while, a larger calf will be come along. Maternal: The daughters of M326 are now in production. As you can see from the pictures of the daughters, they have plenty of milk and are consistent. They are deep, high volume females. The teat size and udder suspension are good. Some, depending on the cow family, may have a little longer teats than I would describe as perfect. Carcass: M326 has very little company in the Hereford breed when it comes to carcass merit. His trait leading REA and IMF combined with trait leading growth are highly accurate and consistent with most all his calves. In our feeder steers of 2006, all the M326 calves graded Choice or better. One of them was our first Prime, Yield Grade 2 Hereford steer. General Comments: M326 is a bull that helped us change our direction. We have been able to use him to maintain performance and vastly improve carcass traits. 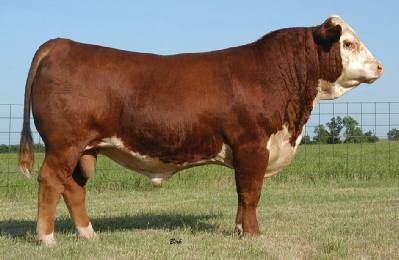 In the future, many very good performance cattle will trace back to this breed changing sire.